Read Part one (Croatia) HERE. As we were driving through Croatia towards Slovenia I reflected on the conundrum about why places that are not so distant geographically, or different geologically, or that share similar climates, can have such different wine cultures. Why is it, in this case, that two adjacent countries, both originally part of the greater Austro-Hungarian empire, both more recently submerged in the greater Yugoslavia, should be producing such radically (and qualitatively) different wines. Slovenia has certainly always benefited from being adjacent to Italy on one side and Austria on the other. The border between the former two countries is very fluid, even arbitrary, and as a result the Gorizia/Collio gastronomic culture spills over to the Slovenian side (Goriska Brda). The vineyards of growers literally straddle the border. The Croatian border, however, is still a firm one, as if they are metaphorically locking out/locking in identity. 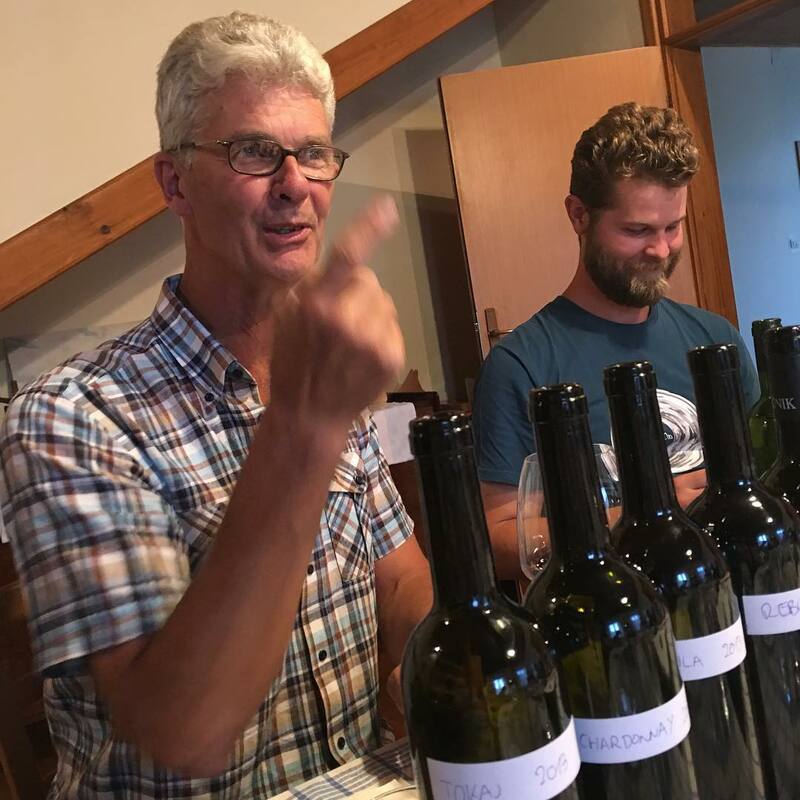 The growers we visited in Slovenia were tiny producers, who attend the best wine fairs, and are trying to prove themselves in the wider wine world. Slovenia’s burgeoning wine culture was given a further impetus by the skin contact movement which was founded and popularised by Slovenians living in Italy, namely, Gravner and Radikon, Bensa, Kante, Skerk, and later Princic and Zidarich, with Valter Mlecnik on the Slovenian side of the border. They travelled variously to Georgia and other parts of Italy, spoke to oenologists, professionals and colleagues, researched books about local grapes and winemaking styles and set out a blueprint for future winemaking practices. One of the most influential salons and movements in Italy today, driven by the leaders of the skin contact movement in northern Italy, is Vini Veri in Cerea. Whereas Slovenian growers, influenced again by the example of Gravner, Radikon et al, were to embrace organic farming (around the early years of the millennium), Croatian growers stuck to the tried-and-trusted. “There was simply no logical reason for anyone in Croatia to farm organically. Growers went from selling grapes to co-ops to capitalism, where you have to fight for existence, feed your family in a marginal economy, get a loan and then find ways to repay the loan. Organic farming was – and is – viewed as a luxury, rather than a necessity. Compare to Slovenia’s economy, which has been stronger, more adaptable, and more diverse. (Slovenia joined the EU in 2004, whereas Croatia was the 28th member state in July 2013). 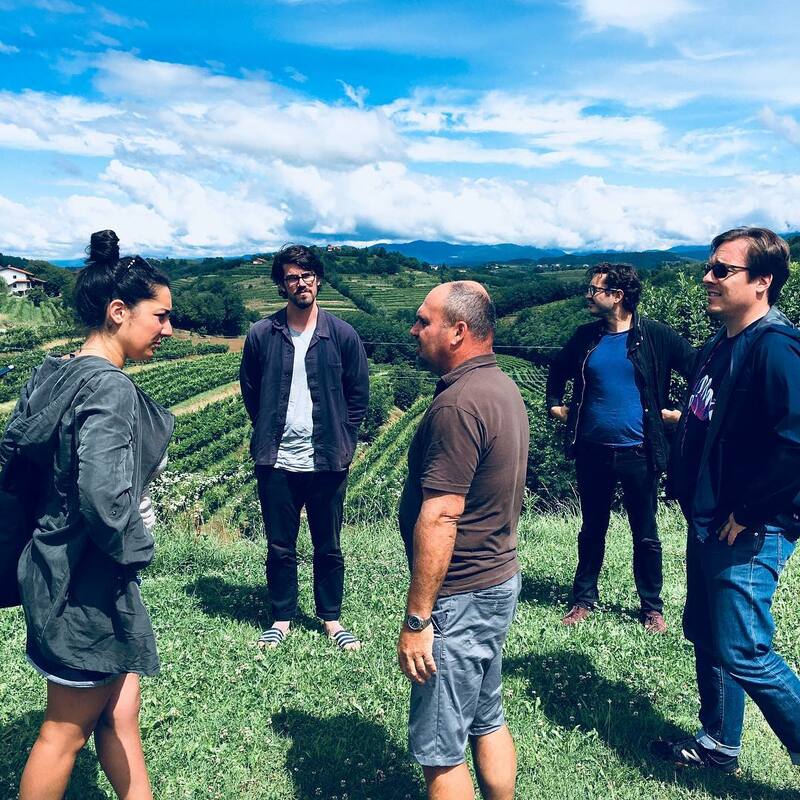 The growers we visited in Slovenia were tiny producers, who attend the best wine fairs, and are trying to prove themselves in the wider wine world. They don’t have a lucrative life style; they make just about enough wine to get by on and are humble enough to allow the wines to express the territory as naturally as possible. Slovenian wine culture seems rooted in these verities and will endure, whilst Croatian growers need to decide whether to look outside for inspiration (and not just to Bordeaux and the oenologists who would Parkerise the wines) but to their neighbours – and elsewhere in central Europe – for a more dynamic approach to farming and winemaking. NANDO farm is located in Plesivo, Brda in the Primorska region, bordering with the Friuli-Collio region of Italy. Of the 5.5 hectares, 60% are located in Italian Collio and 40% in Brda. Brda is the Slovenian for Collio (hill). The favourable Mediterranean micro-climate is mixed with warm sea air arriving from the Adriatic Sea in the south, and cooler temperatures from the Julian Alps located north of the farm. This unique climate is particularly suited to white wines. The vineyards are terraced at an altitude of 100m to 200m, and planted predominantly with local (indigenous) Rebula, Tokaj and Malvazija as well as a little Chardonnay, Sauvignon Blanc, Cabernet Sauvignon and Merlot, in a poor soil of crumbly marl or “ponka” as it’s known in the local Italian/Slovenian dialect. To protect against disease, copper and sulphur treatments are used sparingly. Chemical agents are not used. The soil is planted with grass and other cover crops, and the harvest is manual with grapes harvested in full maturity from September to October. Spontaneous fermentation without the addition of selected yeasts, sulphur and other chemicals. Minimal amounts of SO2 are added, and then only at bottling. Andrej’s wines are solidity personified. Not flashy, they are connected to the earth, ambered by the Med, cooled by the mountains, and are simultaneously chalky and rocky, herbal and dry-spiced and thoroughly wholesome. Andrej Kristancic, owner of NANDO, has been making wines on his family’s farm for nearly 25 years. 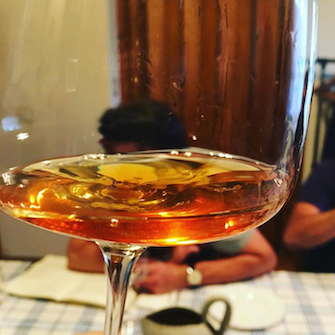 He studied winemaking in high-school, allowing him to expand on his personal style while continuing the family tradition started by his grandfather, Nando. Andrej has a low interventionist style, combined with a true farmer’s knowledge, humility, and dedication to tradition marked with his own personal expression of winemaking. Like so many vignerons, he made the transition from conventional farming and winemaking to adopt his more organic, non-interventionist approach. The Blue Label wines are fermented with their own yeasts in stainless tanks after a very brief maceration on skins. Malvazija is the most inviting and mineral-fresh of the three wines; the Jakot (Friulano) the most floral (elderflower aromas) and delicious, and the Rebula is the most textural, sportin a pronounced character of wild bitter herbs and fennel. Its Black Label counterpart is fermented 5-6 weeks on skins and aged for a lengthy period in used barrels. With its beautiful bronze colour and powerful yet integrated tannins, this is a profound infusion of a wine. The 2015 Rebula was beautifully balanced, with dense yet fine and impression of warm spices. Rebula, the last grape variety to be harvested, comes in the lowest alcohol, and seems to have absorbed the maximum from the vintage and the vineyard. Andrej’s wines are solidity personified. Not flashy, they are connected to the earth (earthy is a recurrent descriptor of the wines we tasted throughout our trip to Cro/Slo/Styr), ambered by the Med, cooled by the mountains, and are simultaneously chalky and rocky, herbal and dry-spiced and thoroughly wholesome. Next stop was Posestvo Burja in Podnanos in the Vipavska Dolina. Rich descriptions of Vipava viticulture and winemaking can also be found in winemaking for Slovenes (Vinoreja za Slovence – the first Slovenian book on viticulture) written by Matija Vertovec in 1844 and in The Glory of the Duchy of Carniola (1689) by Johann Weikhard von Valvasor. According to location and natural geographic features, the Vipava Valley is very much betwixt and between, wedged between the Trnovo Plateau to the north, and Karst to the south, a mixture of Alpine, Mediterranean and Continental climates. 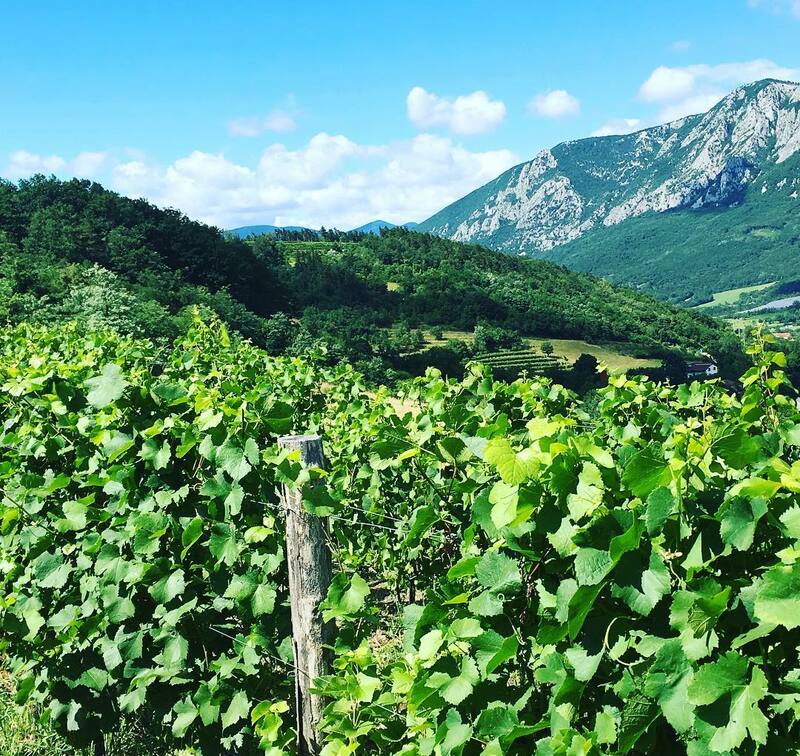 The Vipava Valley is also the windiest part of Slovenia, noted for the gusts of its famous wind which blows with furious gusts – the bora (burja). Primoz Lavrencic is a progressive guy. His wines are distributed by our colleagues, Les Caves Italia, and he is married to Benjamin Zidarich’s sister, so we have plenty of things in common. The Lavrencic family moved in the Vipava Valley as far back as 1499, and like the majority of the population, engaged in agriculture and viticulture. Primoz’s mother’s family were blacksmiths, and also owned some vineyards. I am indebted to Indie Wineries‘ website for their explanation of Primoz’s philosophy. Primoz Lavrencic is a lifelong student of classical philosophy and applies it to his winemaking artistry. In the vineyard he describes his approach as being based on Aristotle’s “The Metaphysics,” which is also informed by his personal Spinozan Pantheistic approach. Primoz believes, that wines from different places, different cellars, different winemakers, all contain their own idea, or essence. Wines should be bottled as their own individual expression, sui generis. They are bottled as their own expression. Primoz find that wines that yield to the terroir are the freest in their individual expression. The wines he crafts are meant to act as a sort of proof for this thesis. He recognizes that the experience of a wine depends on the knowledge, culture and past experience of the drinker, thus it’s a fact that the same wine can generate different, even contradictory experiences. I suspect Primoz would slightly deprecate the idea that he was a Spinozan Pantheistic vigneron. (membership of this movement: one). Respecting the local varieties, however, Primoz adopts a holistic approach to farming and winemaking. He grows varieties that originate in Vipava Valley and along the northern Adriatic coast, namely: Zelen, Pokalca (Schioppettino), Refošk (Refosco), Rebula (Ribolla Gialla), Malvazija (Malvasia d`Istria), Laški rizling (Italian Riesling, Welschriesling), There is also some Modra frankinja (Blaufränkisch), whilst he inherited a vineyard of Modri pinot (Pinot Noir) that has become his not-so-secret-passion (as a committed Burgundo-phile). The diversity and richness of the vineyards is impressive. He believes that a thriving microflora are an integral part of each vineyard’s identity and encourages their proliferation by practicing organic and biodynamic farming. He appreciates the nuances of soil type and climate diversity in individual locations, and farms accordingly. Primoz’s wines are playful. As befits the darting mind of the vigneron and the stony soils and the climatic and microclimatic niceties, they are sharp at their core with dancing freshness. In the winery Primoz only controls a few things such as temperature and the degree of oxidation in the cellar. He allows spontaneous fermentation and ensures contact between grape skin and must with the white wines. The diversity of yeast strains contributes to the complexity of the wine and provides an original expression of each vineyard. 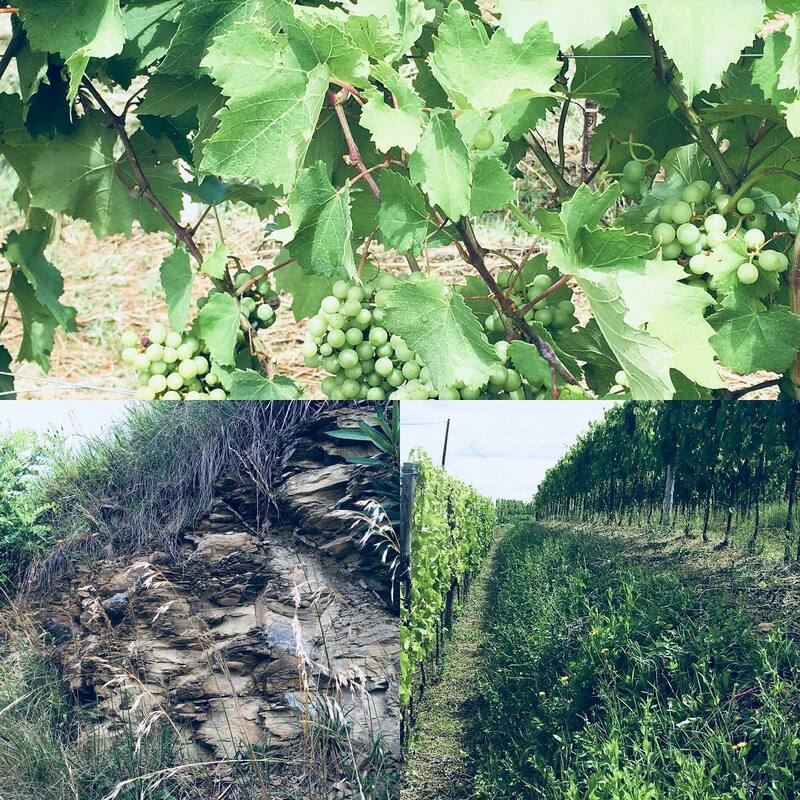 The vineyards have their roots in sedimentary flysch, the composition of which differs significantly according to lithologic varieties of the bedrock below the soil. In Zadomajc and Ravno Brdo sandstone and marlstone form the bedrock. Marlstone prevails a little, causing middle heavy ground, which retains moisture quite well. It is a similar situation in Stranice, except that marlstone is even more prevalent over sandstone, resulting in even heavier and wetter ground. In the biggest vineyard in Golavna the soil lies over tough sandstone, is thinner, lighter and dries faster. The vineyards behind the winery/house are oriented in various directions. They are surrounded by forest and overlook the village. In the cleft of one of the vines we find a tiny owl’s nest. The views are amazing and you feel good things will come from here. The multi-floored gravity “Hollywood winery”, built into the rocks under one of the vineyards and cooled by the water in the hill, is nearly finished now. 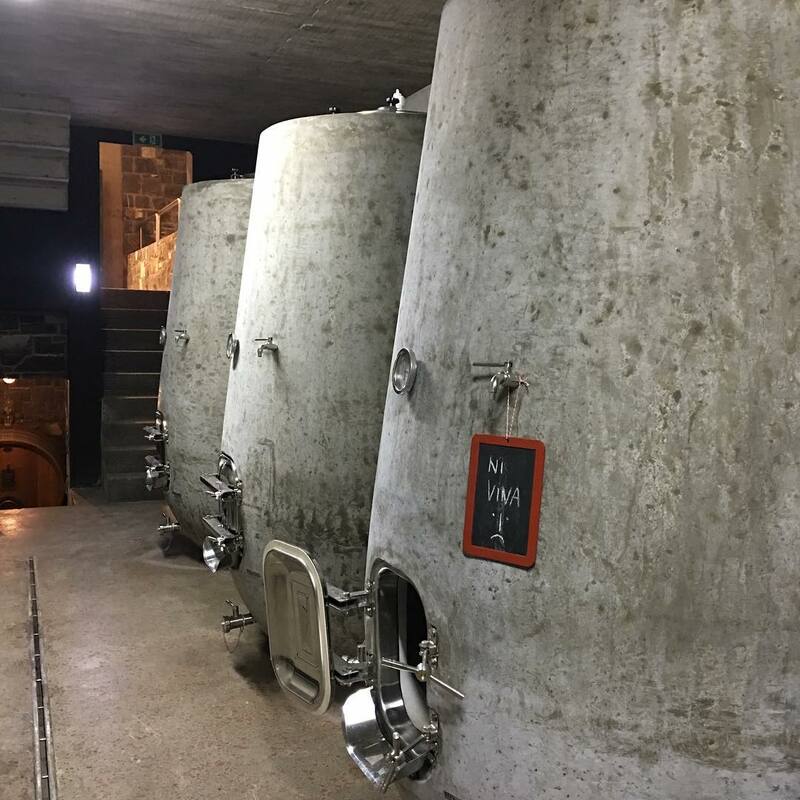 We walk through a room with a formidable array of cement eggs on one side and larger concrete tanks on the other, down into the cellar room with its Slavonian oak barrels taste Primoz’s wines. 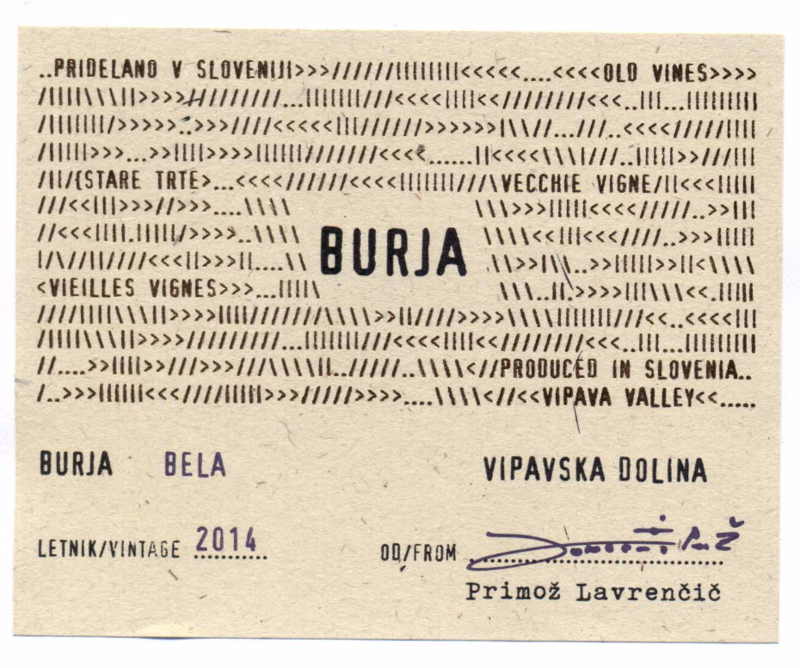 Burja Bela is based on the former glory of the Vipava white wine, Vipavec (win von Wippach). This blend comprises Laški rizling (Italian Riesling, Welschriesling) 30%, Rebula (Ribolla Gialla) 30%, Malvasia 30 %, other varieties 10 % and is a field blend of the two oldest vineyards: Ravno brdo over 20 years old and Stranice over 60 years old with the different vines growing side by side. This wine is aged for one year in foudres of 20-35 hl. Old vine Malvazija dominates the cuvee called Stranice, which is fermented in the eggs. The version we tried exhibited ripe (and delicious) flavours of crystallised mango and pineapple. The exotic, almost tropical fruits, had originally disconcerted Primoz a little, but he seemed more than happy with the final result. 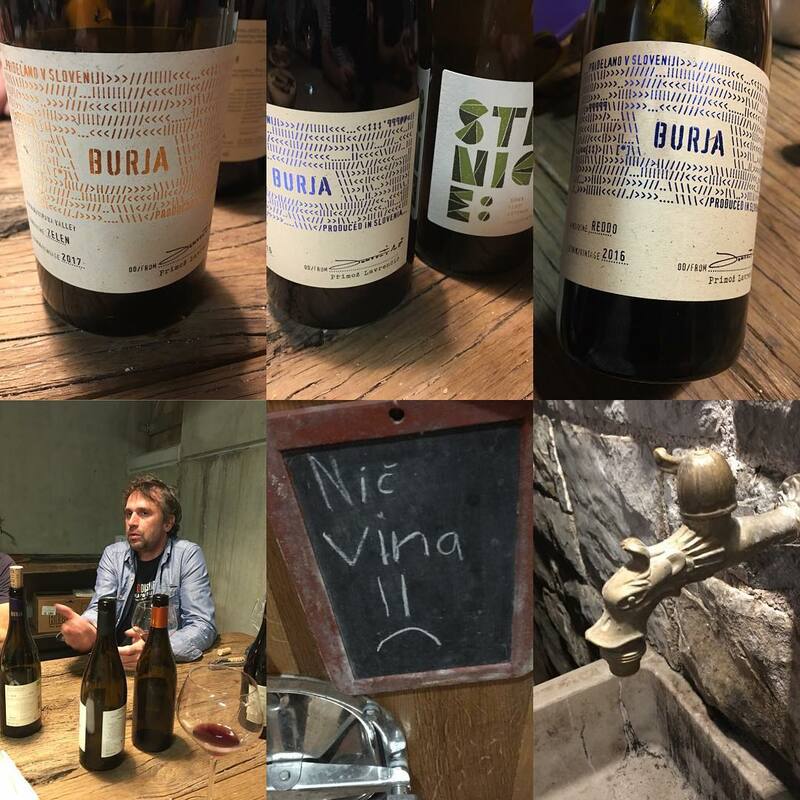 Burja Noir is the aforementioned Modri pinot (Pinot Noir, Blauburgunder) the only non-local variety in the vineyards, though historical records suggest that Pinot Noir has been already present in the Vipava Valley for many years. Primoz’s version, from the vines terraced above the winery, is aged for two years in large barrels (10 to 15 hl) and 225 l barriques. Primoz’s wines are playful. As befits the darting mind of the vigneron and the stony soils and the climatic and microclimatic niceties, they are sharp at their core with dancing freshness. Tasting the 2017 Zelen I can already see the considerable progress. This wine from a native Vipavan grape (Zelen means green in Slovenian) is fermented in eggs and raised in cement vats. Reminiscent of citrus and apples, with undertones of green herbs, particularly sage, it is elegant and saline on the palate, while being equally rich and harmonious. Somewhere between a lees-aged Muscadet and a mini-Vitovska. And we love the flysch winery wall. Very “Vipavawood”. And we can’t wait to visit again to see the egg-shaped pizza oven firing into action. Final stop for the day was the Mlecnik 9ha farm, situated in Bukovica at the western end of the Vipava valley near the Italian border, is planted to a mix of Chardonnay, Rebula, Sauvignonasse (ex-Tocai Friulano), Istrian Malvasia, Pinela and Merlot, all of which produces a mere average total of 12.000 bottles a year. All the grapes for their wines come exclusively from their own vineyards which are cultivated organically. Mlecnik has been certified organic since 2005. Their meticulous vinicultural approach is aimed at producing wines of exceptional quality. They have adopted a training method and pruning techniques leading to very low yields and which also serve to build resistance to diseases and pests. We strolled up the slope; one of our number found a world war one bullet lying atop the turned soils testament to the fact that Slovenia lay on the front line during the major European wars. Klemen, meanwhile, explained that over the previous few years that they had been having trouble with deer and wild boar who descended from the wooded slopes in search of water and took an unhealthy chunk of ripe grapes just before harvest time. Virtually everyone used to farm conventionally. Once they transitioned to organic farming, and then into less interventionist winemaking the wines improved dramatically. You taste this in the energy and life of the wine. These are surely amongst the finest wines (fine as in elegant) in Slovenia. Valter Mlecnik was one of the founders of ViniVeri and also the skin contact movement – the only Slovenian to be involved with these projects. Although they are all Slovenians (discuss!). He has delved deeply into the theory of skin contact and showed us an old book (recently translated into Slovenian) – a two hundred year old scientific treatise on the subject, called Vinoreja (by Matija Vertova). He, himself, is a serious philosophical man, and the wines are the same, being profound, balanced and calm. I would put them near the pinnacle of the skin contact fraternity. The Ribolla, in particular, was gorgeous, because he really gets the extraction just right. Ana Cuvée was lovely also. Ana is named after Valter’s grandmother and is a blend of white varieties – Chardonnay, Malvazija, Sauvignonasse and Rebula. The grapes macerate (skin contact) for three to four days without temperature control. After pressing, the juice was put in big oak barrels ranging between 500 to 3000 litres. This wine was bottled two years after the harvest although it remains in bottle for three years before release. 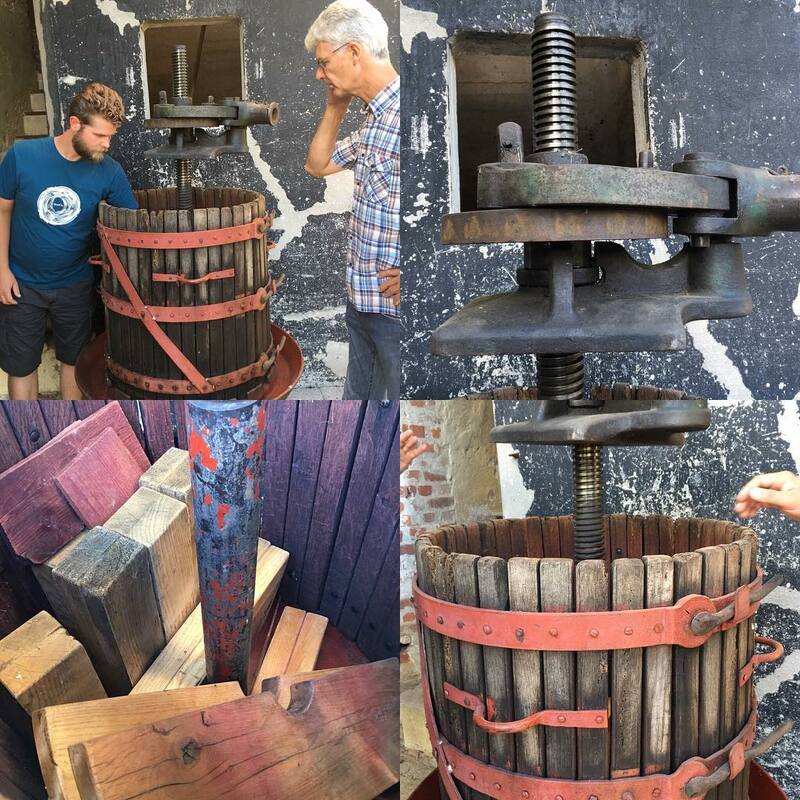 Except for the minimal addition of sulphur and a few traditional interventions like racking and filling the barrels, there was no other method or substance used or added whilst making the wine. Rebula is one of the principle autochthonous varieties of Vipava Valley and as such brilliantly reflects the terroir and vineyards. With its thick skin, it is always last to ripen and produce a wine with the body and tannic structure that reminds one of a red. Mlecnik’s Rebula, for example, was macerated for four days without temperature control and fermented with native yeasts. This allowed the wine to extract the maximum of natural substances present in its skins, ensuring a strong natural stability. The wine is an intense amber colour with brilliant opacity. This is also the consequence of no-filtering approach. After pressing the wine is transferred into big oak barrels, where is remains for two years. During this period the wine carries out a natural malolactic fermentation. We also tasted a couple of vintages of Sauvignasse which was typically lighter on its feet. These are compelling natural wines. Valter laughed as he recalled his first efforts at winemaking – spending 18 hour days in the winery, constantly worried about the temperature, every detail of the process. Now, he says, the winemaking is simple and he is making it simpler still, not worrying about things and spending less and less time in the winery. He proudly shows us his old manual press and how quick and easy it is to assemble and take apart and how simple the extraction is. *Wines must have substance. This is nothing to do with alcohol or extraction, but rather an honest-to-goodness wholegrain digestibility. *Virtually everyone used to farm conventionally. Once they transitioned to organic farming, and then into less interventionist winemaking the wines improved dramatically. You taste this in the energy and life of the wine. *You should do things because they are right for you. *Skin contact and maceration is not a winemaker’s gimmick but an expression of terroir. *The wine is ready when it tells you that it is ready, not when you decide it to be ready. *Sulphur is a cul-de-sac. In some cases. no sulphur was added, but most of the wines had a little. The wine must both be protected, yet also be allowed to stand on its feet. *Beauty is holding so many different forces and energies that it seems to be naturally generated and easy. Wines can be deep and transparent at the same time. Stay tuned for Day Two: Biodynamic diversions with Zorjan!